About this Plastic Stainless Steel Blades Letter Opener:Letter Opener - Opaque with stainless steel blades.Material: Plastic. Related Search Terms: Letter OpenerSpecial Instructions:1 Day Rush, available upon request for 1 color, 1 imprint location orders. About this Plastic Letter Opener Staple Remover:Steel blade quickly slices through envelopes. Lever edge removes standard staples in an instant.Special Instructions:Rush service: 1-color/1-position required. Item color assortments are not available. About this Let - Jet Letter Opener:Sleek, modern design with a protected, stainless-steel blade.Exclusive, patented design (U.S. Patent D421889) is faster and easier to use.Material: Impact Styrene. About this The Office Buddy:Combination staple remover and letter opener.Material: Plastic.Special Instructions:1 Day Rush, available upon request for 1 color, 1 imprint location orders. About this Zip Letter Opener:Simple office essential plastic letter slitter. Each opener features an integral safety blade in a concealed safe plastic casing. About this Business Card Slitter Plus:Hinged clear cover holds standard business card or insertable message card. Features slitter with protected steel blade for opening envelopes. Curved tip for removing staples. Large imprint area.Special Instructions:Rush service: 1-color/1-position required. Item color assortments are not available. About this Letter Opener / Staple Remover:Two Tools in One. Steel Blade.Special Instructions:1 Day Rush: 1 color, 1 location. PMS color matches are not available with 1 Day Rush. About this Glide - Rite Letter Opener:Ease into customers' everyday life when the Glide-rite Opener helps them with their mail and other sealed envelopes.This letter opener is available in several translucent product colors to help you further customize it after adding your company name, logo and advertising message.A cute and fun way to open up letters, it can easily slip into purses, pockets or bags to go between the home and office.It can also be an ever-present reminder on their desks throughout the day.Keep your company in the limelight! About this Value Letter Slitter:Protected steel blade quickly slices through envelopes.Special Instructions:Rush service: 1-color/1-position required. Item color assortments are not available. About this Letter Opener And Business Card Holder:Insert Envelope Into Groove At Right Side, Then Slide It To The Left To Cut.Business Card Holder Slot On Top. About this House Letter Slitter:Protected steel blade quickly slices through envelopes. House shape is ideal for finance and real estate related promotional themes.Special Instructions:Rush service: 1-color/1-position required. Item color assortments are not available. About this Letter Slitter, Screen Cleaner, and Keyboard Brush Tool:Letter Opener and Computer Brush in One! Retractable Key Board Brush and Screen Sweep. Screen Cleaning Edge. BPA Free. Recyclable. Heavy Duty Plastic. Recyclable. About this Letter Opener / Staple Remover, Full Color Digital:Steel Blade.Special Instructions:3 Day Rush: 1 location imprint. About this BizCard(TM) Letter Opener:Big letter slitter with recessed stay-sharp steel blade. Easy to read 3 3/4" raised ruler across top edge.Insert your own business card in seconds, under protective transparent cover. About this Spinning Propeller Metal Letter Opener Paperweight:Spinning propeller metal letter opener & paperweight. Metal propeller spins smoothly on high performance bearing. Bottom of propeller cone is rubber to prevent sliding while propeller is spinning. Propeller can be used as a letter opener and has no sharp edges. About this Business Card Letter Opener With Mirror:Letter opener that holds a standard size 3 1/2" W x 2" H business card. Business card can be placed over mirror. NOTE: Product comes with Prop 65 warning label. Label reads: "WARNING: This product may contain carcinogen, which is known to the State of California to cause cancer, birth defects and other reproductive harm. For more information, go to www.P65Warnings.ca.gov. About this Present - A - Card Letter Opener:Holds and displays a standard 2" x 3 1/2" business card. Each letter opener comes with complete instructions. Long lasting stainless-steel blade.Material: Styrene. About this Business Card Zippy(R) Letter Opener - Blank:Insert business card for instant marketing. Stainless steel blade. Magnetic back available. About this Business Card Zippy(R) Letter Opener:Insert business card for instant marketing. Stainless steel blade. About this Letter Opener:Liqui-Mark's colorful letter opener makes opening letters a breeze. Perfect for any promotion! About this Oval Letter Opener:Cutting blade concealed safely in sturdy plastic.Compact size for easy storage. NOTE: Product comes with Prop 65 warning label. Label reads: "WARNING: This product may contain carcinogen, which is known to the State of California to cause Cancer and Reproductive Harm. For more information, go to www.P65Warnings.ca.gov. About this Heart Letter Opener:Safely, swiftly, opens all kinds of envelopes. Heart design enhances your special, message. Strong, one-piece, solid construction with a stainless-steel blade.Material: Impact Styrene. About this Business Card Zippy(R) Letter Opener with Staple Remover:Insert business card for instant marketing. Dual function letter opener/staple remover. Stainless steel blade.Magnetic back available. About this House Business Card Zippy(R) Letter Opener with Staple Remover - Blank:Insert business card for instant marketing. Dual function letter opener/staple remover. Stainless steel blade. Magnetic back available. About this House Business Card Zippy(R) Letter Opener with Staple Remover:Insert business card for instant marketing. Dual function letter opener/staple remover. Stainless steel blade. About this Handy Letter Opener:Handy Letter Opener. NOTE: Product comes with Prop 65 warning label. Label reads: "WARNING: This product may contain carcinogen, which is known to the State of California to cause cancer, birth defects and other reproductive harm. For more information, go to www.P65Warnings.ca.gov. About this Heart Letter Opener:Heart letter openers are great for promoting healthcare, charities, or a healthy lifestyle in general. Size: 2 7/8" W x 2 3/4" H Imprint Area: Front, 1" W x 1 1/2" H NOTE: Product comes with Prop 65 warning label. Label reads: "WARNING: This product may contain carcinogen, which is known to the State of California to cause cancer, birth defects and other reproductive harm. For more information, go to www.P65Warnings.ca.gov. Thank you Fred, Linda and Kristi! We’re glad to read great reviews on our Office Buddy personalized letter opener. We know it’s a popular product because of its dual functions. The Office Buddy is a great promotional letter opener for employees. They will be able to use it all around your office! Available in blue, green, red, white, and black. Thank you Diana and Austin! We’re glad to read your reviews on giving these away. Whether potential customers or employees, they will be sure to use this promotional letter opener. Available in black, gray granite, red, reflex blue, transparent blue, transparent green, transparent red, white, and yellow. Thank you Audrey and Gaylen for your kind reviews. We always take our time to read our reviews to thank you or address any issues. We know how important presentation is with promotional products. 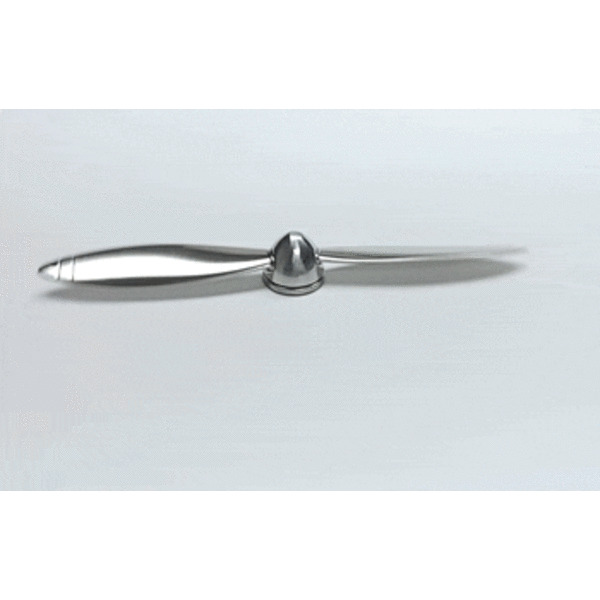 Spinning propeller metal letter opener & paperweight. Metal propeller spins smoothly on high performance bearing. Bottom of propeller cone is rubber to prevent sliding while propeller is spinning. Propeller can be used as a letter opener and has no sharp edges. Order your Spinning Propeller Metal Letter Opener & Paperweight here. With a wide selection of letter openers, you’ll have no problem finding the perfect one to fit your company. We have different styles of letter openers that will fit your promotional needs. If you’re looking for plastic, acrylic, or metal, we have them all available! Letter openers are great for everyone! Avoid the paper cuts by purchasing a letter opener. Your customers will appreciate a much more easy way to open envelopes. Don’t miss out on this great marketing tool! Letter openers are great for an office setting, educational institution, and more! You’d definitely want to use our promotional letter openers at home. Look through our selection of letter openers. Shop here. At AnyPromo, we place a high standard on brand impact, just like our customers. Search our site for a wide selection of custom letter openers, and see for yourself. Trade show and event guests are bombarded with boring branded swag at every moment, so it is extremely important to stand out. Our letter openers are specially priced and proven to generate impressions. Click through our inventory of office must-have on sale now. Here is a snapshot of our selection of 100 letter opening choices. We’re ready to help expedite your order, so give us a call! Grab your promo letter opening swag today! Letter openers are a popular promotional item for any office guru. Office supplies are always popular, and you can never go wrong with a letter opener! Letter openers are great as an employee incentive. It’ll go great in an employee kit with many more of your company items. Give your employees products they will use for a long time. Our featured list of letter openers are popular with many of our customers. Don’t miss out on this great marketing tool!